Wolfgang Mueller Presented Tort Claims in Police Misconduct Cases to the University of Detroit-Mercy Law School third-year Torts class in March 2013. 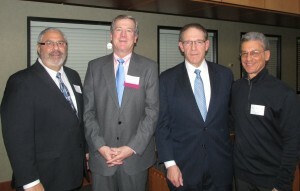 Jules Olsman was invited by Honorable Judge David M. Gubow, an adjunct professor at the University of Detroit-Mercy, to speak about the status of personal injury litigation in April 2013. Jules Olsman presented Game Changer: Selecting the Right Experts and Using Them Effectively at Trial at the American Association for Justice Litigating Nursing Home Cases seminar in Boston on May 9, 2013. Randy Wallace presented Premises Liability v Active Negligence at the Michigan American Association for Justice 2013 Rapid Fire Seminar. Jules Olsman presented the Michigan Association for Justice’s Champion of Justice Award to Federal Court Judge Avern Cohn at the annual banquet.